Regardless of the material that wraps around the facade of your home, we can clean it. Regain the look of your castle with a quick pressure wash from the pros here at Big Clean! Driveway looking dirty and dingy? 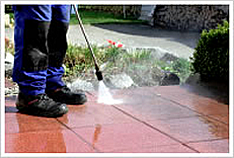 Revitalize the drive with a quick power wash. We’ll have your driveway looking perfectly new. Pressure washing your deck or fencing structure makes it look pristine. Moreover, pressure washing preps the wood for staining or painting if you’re looking to truly reinvigorate the look of your wood. Regardless of your pressure cleaning needs, you can count on our cleaning experts here at Big Clean. And remember, we also provide gutter cleaning, window cleaning, and dryer vent cleaning services! Get in touch with us today to book your cleaning appointment! Why Choose the Big Clean Team?